On January 30, 2012, my husband Mark had bilateral total knee replacement surgery. Thinking it might be helpful to others who are considering having this surgery, I blogged about the preparation beforehand, the surgery, and Mark’s recovery. You can find links to the knee surgery posts below. I need to have both of my knees replaced soon and I’ve been trying to decide if I should do them one at a time or both at the same time. I’m enjoying reading about your and your husband’s experience. Right now I’ve tentatively decided to do both at once, get it over with and then get on with the rest of my life. I just wanted to thank you for taking the time to write about your experience. It has helped me prepare for my own. I’m glad it’s been helpful to you. I hope you realize that Mark’s recovery has been faster than typical for a bilateral replacement. I think it depends on your age and how motivated you are. It sounds like you might be motivated. Mark did the pre-operation exercises religiously. We both think that helped. Now that we are this far, we are glad we did it this way for the same reason you’re thinking about it. But I have to tell you, when we were still in the hospital and I saw how much easier it looked for a single knee replacement patient, I had my second-thoughts. Thank you so very much for your wonderful blog. I’m considering having a bilateral replacement in October of 2015. I want to be ready physically and at my best for healing. Fall is best time for me to be healed and back on my motorcycle for riding season in the spring. My orthopedic surgeon is a biker also and has had a total knee replacement so he can empathize with me. What I’m curious about is coming home. My husband works fulltime and while my daughter-in-law from out of town can come for a week or so when I get home, after that I’m on my own. I am assuming that because of this situation I will need to spend time in a rehab facility then home PT visits. What are your thoughts? Good luck with your surgery. It sounds like you are highly motivated. I suspect your recovery will go well. Thanks for stopping by. hi christine what a wonderful help thank you i am lying on the settee after having key hole investigations on both knees this morning feeling sorry for myself the disharge letter states patient will require bilateral the next bit is hard to read says ter 5 l.r any idea what it all means please . i have the added complication of being the main carer for my wife cancer survivor with horrible complications ie tounge voicebox removed with larengectomy so need to make a big decision, thank you. Dear Christine, I found your diary regarding Mark’s simultaneous bilateral replacements very useful. I live in England and I am 67 years of age. I had my operation on 15 th Dec 2016. My radiographs do not look too dissimilar to that of Mark. My progress is also similar except two weeks on I have not quite progressed to a cane yet. I think I soon will as I can walk by lifting the Zimmer frame off the ground as of yesterday. It is possible that we had the same ConforMIS custom implants. Two weeks on today, I am going to remove my staples. Last Thursday I had a wound check. The nurse was pleasantly surprised how good it looked. Could it be Turmeric and Ginger(both recognised as antiflammatories) that I started taking 2/3 weeks prior to the surgery? I am otherwise very fit cyclist. I started exercise bike some 4/5 weeks prior and lost my tummy although I am by no means overweight. I also do yoga regularly which is great pre and post op. I was discharged from the hospital 4 days post op. I could bend my knees at 90 degrees on the day. I found getting into bed was easier if I slide upwards from the bottom edge of the bed so knees do have to be turned and lifted as such. In England, I was not recommended to use passive exercise machine. Instead you are encouraged to exercise whilst sitting down or in bed. I was sick with morphines so managed on Ibuprofen and Paracetamol (Acitominophen). I have had discomfort and very rarely pain ( 6/10) very occasionally . Annoyingly, stockings are recommended for 6 weeks! Currently I can flex slightly more than 90 degrees. Working on that this week. Thanks for sharing your details. I’m glad you’re doing well. I know the action of cycling is very helpful at strengthening the needed muscles around the knees. Keep going. You’re doing great. I had bilateral total knee replacement on November 17th 2014. I can only say, this was a walk in the park. I was never in any pain, of course I was given pain meds, but I was never in pain. My surgery was on Monday, I was up walking (with a walker) about 50 feet. Day two (Wed.) they had me walking the halls of the hospital and some stairs in the rehab room. Thursday (my 70th birthday) I was released to go to a rehab hospital. There I had therapy twice a day until released the following Tuesday. At no time was I in pain, some discomfort, but never pain. The following week, (the week after Thanks Giving) I began out patient therapy three days a week, where I worked hard pushing myself to do all I could. This was where most discomfort was experienced, but I always looked forward to going. I could have worked harder at home, I guess I did enough, I was released from therapy earl, having reached 130 degrees ROM on both knees. I will admit I slept in my recliner for the first couple of weeks, I couldn’t get comfortable in bed. My surgeon said that was an individual situation, not everyone has that experience. In five weeks I was driving and going in my office occasionally. Week six, I was driving every day to work every day and started working out at my Health Club 5 days a week. MWF I swam and TT I was in the weight room. I started swimming 1,000 yards, mostly kicking with work out fins, then 1,500 yards the second time. Sometime the second week I did 2,000 yards, I stayed there between 2,000 and 2,200 yards for a few weeks. Now it has been six months and I am doing 3,000 yards a workout, 2,500 kicking (with workout fins) which takes 1 hr and 15 minutes, then I swim a 500 yd freestyle. The reason I have gone in to such detail is I think my workout regiment is that I as well as my surgeon believe that is why I have done so well. I have good friend who had the same procedure with same Doctor one week before me, however his expectations for himself weren’t very high and he hasn’t had the same progress I have made. Although, he has the same story about no pain. I would encourage anyone that has an athletic background to do them both at the same time, it seems to give you a different perspective on comfort. It really was a breeze, and most people tried to talk me out of doing them both at the same time. Hello Terry Huston, where did you have surgery, and who is the doc? I’ve got to travel from a small island to go where they have more specialized ortho care. I need both knees done and here they think I’m crazy. Getting yourself prepared before the surgery is absolutely needed. Don’t worry too much because complications are rare and the success rate for knee surgery is high. Good luck on your surgery. Anyway, here’s a quick link that might be able to help you: Best Knee Replacement in Mexicali Mexico. Read it, there’s a section where the benefits of knee surgery is mentioned. Hi, just reading all messages regarding bi-lateral knee surgery. I had both knees done Jan. 13, 2014. Up on walker next day and never looked back. No pain (drugs helped) and even After pain meds at home, three weeks later felt great. Started physio the week after my 6 day hospital stay. ( physio started in hospital, day three). Did all my home physio and three months at hospital physio. It is know mid December, I have golfed all summer, currently curling (using a stick)’ feeling great. Still some numbness around outer sides of knees and unable to stand on knees, but, no pain, stiffness in morning but at 65, that is common, once I get moving I am ok. My friends think I am amazing with everything I am now doing after my surgery. Hello! I am 31 and was born with congenital defects of my feet and knees. I am looking at having both of my knees replaced. I do not have a lot of movement in my knees right now (never have) so having the knees replaced would give me more movement than I’ve ever had which is exciting. However, my father had his knees replaced and is doing well but is very scary for me. How much was your husband able to fend for himself the first month out of the hospital. This I worry the most about as I don’t know how much help I will have. This sounds pretty exciting for you. I’m not sure my husband’s case is typical as it seems he recovered really fast. I would say for the first week he needed a lot of help. I kept the ice in his ice machine filled, I carried the CPM machine to and from the bed (not everyone has this, but I think it really helped him a lot.) I brought him food and drinks. He was able to get up by himself with his walker, and do all his personal hygiene needs by himself, although I did wash his hair for him. I brought him his beverages, and prepared and served all his food. I also helped keep track of his medicines. He was able to dress himself, but I had to help with the tight stockings they wanted him to wear (not everyone has to do this). He quickly became able to do most things for himself, given the constraints of using a walker. I had to move the CPM machine back and forth for him the whole time, and I don’t remember how long we had it. But you could set it up someplace where you wouldn’t have to move it. We had it in our bed. I, of course, had to drive him to therapy for about six weeks. He went about three times a week. The hospital he was at made sure he was able to care for himself pretty much, before he left. Some people had the option of going into a facility where they could recover if they didn’t have the help they needed at home. This is something you might look into. I hope you’ll stop back afterwards, or while you are recovering if you have any questions, and let us know how you are doing. Best of wishes. Wow! I was searching for positive information on bilateral knee replacements..and there you were! Amazing to read. I am a “retired” nurse, age 56 with surgery scheduled for bilateral knee replacements on Sept. 12, 2012. I am doing PT for strenghtening. I started my lists in preparation for the big day and the weeks after ( our lists matched just about perfectly! ). I know healing and progress varies with us all. I am so ready for this and I thank you and your spouse Mark for sharing your journey. I’ve glanced through your other blogs and I also share many of your interests and experiences! Funny how we can touch each other’s lives by reaching out just a little! I look forward to reading all your blogs in the near future. Mark was 55 when he had the surgery. You should do fine. I think his vigilance with the therapy exercises helped a lot. I hope to hear more from you on the other aspects of my blogging. And I do hope you’ll let us know how you’re doing following surgery. Best of wishes for an uneventful and speedy recovery. I just read your story and hope that Mark and you are doing well. I’m just starting the process of meeting with doctors for knee replacement. I have had rheumatoid arthritis for 20 years, had my hips replaced at age 40, with 3 revisions to one hip. So I know a bit about joint replacement, but knees aren’t hips. I found your blog to be very informative, and while both my knees are equally bad, I was considering having one done at a time. After reading this, I am now considering having bilateral surgeries. Don’t know if I have the courage just yet, but I do know how important it is to follow the rules and put all you have into the physical therapy. Thanks for sharing your story with others. Thanks for stopping by. Because of your previous surgeries, I don’t doubt you are quite well informed about what to expect. I will tell you that in the hospital and even later, I was a bit envious of those people whose spouse or significant other had a single knee replacement. It almost seemed like a no-brainer. Since you’ve already been willing to have multiple surgeries and are likely a patient and determined individual, you might want to think about doing only one at a time. It looked a lot easier. I’m sure she would give you her opinion of having them done separately if you asked. Well, I had surgery April 29, this year and am faithfully doing my exercises at home. I am still in therapy and I am only 111 degrees conistently. I do not know if I have done the right thing, but it is done, and I figure they should last the rest of my life. There are two things I really want to do and that is ride my bike and lose about 20 lbs. I am hoping I can do this to make it easier. It has been a long haul it seems, but I have a good therapist, although it seems I live there at the moment. After 40 sessions I have been approved for 8 more from the insurance for which I am thankful. I pray that your hubby is doing well and on the speedy road to recovery. God bless you all. I’m glad you’ve got the surgery behind you. I know it took my sister-in-law over a year, I think, to get to 120 degrees. I think it sounds like you’re doing great. My husband is, and has been well recovered for a long time. He is a LOT better off than he was before the surgery. I think you will be too. It may just take you a little longer to get to a place where you’re comfortable. I want to lose a significant amount of weight too, because I know that will help my knees and maybe prevent me from having to have surgery down the road. Keep up the good work. You’re only a little over three months into your recovery. You’ll get there. I’m happy to hear of your success. I’m sorry for my delayed response. We’ve had a crisis this month with my parents that has been taking and continues to take all of my time. You’ll get there. Keep up the good work. Thank you so much for sharing Mark’s journey. I am having bilateral TKR on January 17 and am looking forward to the day when I will have less pain and more mobility than now. I also realize that Mark is definitely the “poster child” for bilateral TKR! Wow! I also appreciate all the details that you shared regarding pre-surgery planning and day to day survival. You are an amazing woman. Best of success with your surgery. Our lives have been dramatically changed for the better since last January when Mark had his. Mark may have been a “poster child” as you suggest, but I’ve heard from other people who are doing quite well. Just follow the directions and do the therapy as best as you can. Let me know how you’re doing. Christine – I’m late to the party, but your information is GREAT! I’m scheduled for bilateral in five days (Arpil 1, 2013) and am very encouraged by your blog and Mark’s recovery. I’m going to save this to use for encouragement and inspiration. I’ve found when I ask people who have actually had knee replacements exactly how it went in and out of the hospital they are all pretty fuzzy about details and the first month (no doubt thanks to the pain and good drugs). Your third party reporting answered most of my logistics questions. Thanks again and I hope you both continue to do well. Good luck on your surgery. Let us know how it goes. Christine–bless you for your blog about your husband’s bilateral knee replacement. It gave my husband, who is 59, a positive attitude before his identical surgery which was done February 6, 2013. He had plenty of negative advice from well-meaning friends, who felt that doing both knees at one surgery was a big mistake, but he felt that with God’s help and much determination he could get back on his feet and back to work driving truck. My husband had an excellent therapist who was well versed in bilateral knee replacement, and the exercises she assigned helped him to regain his mobility rapidly and also achieve his goal of returning to work. He worked very hard and “graduated” from therapy with his therapist’s approval on March 15. He was back in the driver’s seat the last week of March hauling feed commodities five days a week, thankfully home every night to sleep in his own bed. He goes up and down flights of stairs to take his ticket to the office, besides other “on the job” exercises. He faithfully pedals his stationary bicycle (which he feels has helped to limber his knees immensely) every day. All in all, his sense of well being is back and he is doing great. Okay, here’s my question: how long did your husband continue to do his therapy exercises at home? Was there a time when he realized he wouldn’t regress without them? My husband (whose name is also Mark:) wonders how long to continue his therapy exercises at home. I know you won’t want to stick out your neck too far to offer medical advice, but you haven’t given an update on your husband’s therapy routine past two months post-surgery. Does he still do exercises, and if so, what is his routine? If not, when did he feel comfortable stopping? I can’t find any help on this subject online. An update would be much appreciated. Thanks!! OK Christine – I am going to add myself to the list of those who went seeking any honest information on bilateral replacements and found your blog. I am a 61 year-old male who recently resigned himself to the idea that the stalling tactics were done and it was time to talk replacement. At first my doctor scheduled one replacement but after I went home, I started wondering if it would make more sense to have a REALLY LOUSY summer and just get both done at the same time. Most people I spoke with thought me nuts to even think that way but I called my doc’s scheduler and asked her to ask him if he would consider doing bilateral. She replied that in her years working for him he had only done bilaterals twice so she suspected the answer would be no but a couple hours later she called back to say he surprised her by saying I would be a good candidate. I went to see him again and left scheduled for bilateral replacements on June 25, 2013. I admit being pretty worried about doing this but mostly for reasons I suspect differ from many other’s. First – I am a clean fanatic and sometimes take two (or more) showers daily so I cannot imagine how grungy I expect to feel during the early rehab phase – YUCK. Second – I am pretty (OK, obsessively) awful about caring for myself and am quite terrorized at being nearly helpless for weeks? I am much better at taking care of others than having anyone help me so I am truly dreading these things at least as much as fearing infections and blood clots. Also being “only” 61, I am already worrying how long these new knees will last before having to be re-replaced when I (God willing) will still be here but older and presumably less healthy. Just curious about how/what thoughts your husband might have on the longevity and eventual replacement of his replaced knees in another 10-15 years. Any thoughts? Anyhow, I appreciate your efforts and send my thanks for posting them for folks like me. I’m glad you found the site and hope the information is helpful. If all goes well with your replacements, it may not be as lousy of a summer as you are worried about. If you are highly motivated and heal well, you may do just fine. Several of my readers reported doing well also. Mark’s doctor only does one or two bilateral surgeries a year. It’s not done that often, perhaps because of insurance reasons. Mark’s doctor told us flat out that the insurance companies do not compensate him nearly as well for the bilateral surgery as they do if you have two separate surgeries. I don’t know if that is the case with your doctor or not. Mark is pretty committed to his shower-a-day as well. And I was concerned about this at the time, but it didn’t turn out to be an issue. I think he was able to get in the shower fairly quickly. Prior to that I helped him wash his hair in the sink and he gave himself a sponge bath that he felt was adequate. Although I know he was thrilled when he was able to get in the shower again. It just depended on the incisions. He was able to stand well enough pretty early. In fact, he never used the shower bench that I bought for him. Mark was not as helpless as I had feared he would be after about the first week. I will admit that I was not supposed to leave him home alone and I did worry about what would happen in the case of a fire or something, but he was able to get himself up and to the bathroom when he got home from the hospital. He walked in from the car. I had our son with us in case I needed help, but I really didn’t. Maybe it’s a good opportunity to let the others you have helped have a chance to help you in return. Mark does not plan on having to replace his knees. He was told the knees they put in today last 30 years. His mother had her knees done over 20 years ago, and at the time they were supposed to be 15 year knees. She’s still walking fine on them. No problems. That sounds like one of the worries you could put to rest for now. We watched the entire series of Band of Brothers on DVD while Mark was recuperating in bed and exercising with that machine. I don’t know if you will have to use that machine or not. But it might be worth while to stock up on a few DVDs. Best of wishes. Let us know how everything goes. Hooray for you! You made it over the hard part. It sounds like you are doing quite well. I agree that someone who is older and perhaps not as strong might be wise to go it one at a time. I know I felt that way when i saw single knee replacements walking through the hallways. It looked so much easier than what Mark and you had to do. But I’m with you—you’re all done. Terrific. Stay well. And thanks for checking back in. I know others will benefit from it. I really can’t thank you enough for very generously sharing your and Mark’s experience with us! My surgery is scheduled 2 weeks from now. I live by myself and am a 55 yr old female. I am only worried if I will be able to get up and get to the bathroom ok. Other than that, I can get through just about anything! I am a very fast healer and as (hard-headed) dedicated as Mark. Well maybe half as much as Mark. He is a super-hero to me!!! 🙂 You have given me some bench marks to look forward to and have eased a ton of my concerns. Can’t thank you both enough! You really have an impact on people’s lives by sharing this info! I hope you realize the power your words have. YOU are a super-hero to me as well!! Good luck on your surgery, Tammy. It sounds like you will do quite well. I don’t think you should worry too much about the bathroom. Mark actually made his own way out of the bathroom while he was still in the hospital because he got tired of waiting for help to return. I think you will be surprised at how soon you are able to do things. Hopefully all goes well. Let us know. Sorry I didn’t get back to you sooner, Tammy. I haven’t been on my computer much the last few days. I’ve been thinking about it, and honestly, Mark was able to take care of his basic necessities pretty early. I don’t know if you will have the exercise machine. That might be something you want to think about where you will be able to put it so that you don’t have to move it back and forth from the bed. The other problem was that I had to go to the drug store and get him things. Hopefully you will be able to manage that through a relative, friend, or a delivery service. I had set up a card table in the bedroom for things Mark needed – he had shots to take, and hose to put on his legs. I think he had a lung exerciser. I thought it would be easier to keep those things in the room where he spent most of his time at first. I also had a basket of snacks for him and a large lidded mug of ice water. I suspect you will not go home until you are able to do what you need to do. The only thing I can really think of is meals. It was difficult for Mark to get around in the kitchen and do things while he was still using his walker. So if you can have some easy meals around, I think you will be glad you did. I would love to come to Florida, but alas, have comittments here that prevent me. 🙂 You will do fine. I think it sounds like you are doing really well. Mark did have weird feelings in his legs that made it hard to sleep sometimes. I remember he asked others about it and they had the same problem too. It eventually went away. Mark got his flexibility to 120 degrees, so I don’t know if that is something you will need to work at or not. I remember it took his sister a year to regain her flexibility when she had one knee done. I don’t know what to tell you about all that standing. I would just suggest you use the pain medication, hopefully non-addictive over-the-counter stuff will work, as you need it and be patient with yourself. It quite a tremendous thing that just happened to your body. It’s too bad about your boss not being more understanding. Can you ice your knees at lunch break? I know I’ve found that ice really helps my knees (I haven’t had the surgery, and hope I never have to.) I have a couple of blue ice soft ice packs that I keep in the freezer. I wrap them around my knees with ace bandages. Maybe you could find a way to do that at lunch. But it sounds like you are doing great with all your activities. Keep up the good work. I just found this blog as I am looking for helpful suggestions and expectations. My bilateral knee replacement will be December 16th. I can see many changes in my house starting this weekend. We’ve already made some changes, but many more are looking like they’ll need to take place. Here’s hoping I can recover as quickly as Mark did. I hope you can recover quickly too. If you read through the comments on the various posts about Mark’s surgery, many others also had success stories. Best of luck to you. It was the best thing Mark ever did (outside of marrying me, of course). Stop back and let us know how it goes. Hi there, reading marks blog has given me alot of information as i am in the process of needing right knee replacement definately and possibly left. I am considering bilateral as I am out of work, and cannot keep putting off getting a job and waiting for surgeries. Wait times in Ontario Canada are terrible. One thing I was wondering did Mark have general anaesthsia or an epidural, and if he stayed awake what did he hear and smell. I have heard its not worth staying awake for, but i get extremely sick after being put out, so i have been thinking that would be better for recovery if I try to stay awake depending to on what my surgeon recommends. Thank you for all you have posted here. Mark had general anesthesia. I can only imagine what you might hear, and possibly smell if you were awake. Maybe there is some kind of compromise for you where you have something that dulls your senses, but doesn’t put you all the way out and an epidural. Your surgeon may know, or a good anesthesiologist. I have not heard of anyone staying awake for this surgery. Mark’s took a couple or several hours, I can’t remember exactly. Best of wishes making your decision. You will feel a lot better once you are through it all. It sounds like you are doing amazing. It’s pretty major surgery, it will take some time to get back to normal. Or in this case, hopefully better than normal. Patience. You’re doing great. I had bilateral knee replacement in July 2013 and had nerve blocks. I was not awake during the surgery and heard nothing. I also had no post-surgical nausea which was wonderful. I am so glad I had the bilateral knee replacement. I returned to work after five weeks, returned to driving after a month and have done extremely well. One thing that I felt was helpful was four months of pre-surgical strengthening at a local health facility. I continue to work out 4-5 days a week and truly feel good. Best of luck to you. Thanks for sharing your experience, Arlene. Thanks so much for your blog! Like Mark, my family runs ‘creaky.’ My surgery is scheduled for the 20th. I have been to the classes, but your blog, has put my mind at ease. I can do this, yes I can. Of course you can. Best of wishes. Good luck with your surgery Michael. It’s good that you are going in prepared. I think that will help alot. That would actually be my only advice: do all the therapy they recommend. Let us know how things are going for you. Wonderful. Keep it up. Are you going home soon? You and Mark have been an inspiration to me and my wife in reading your comments and your personal experiences as we prepare for my bilateral knee surgery on Feb 11/14. I live in Calgary Alberta so getting out and walking after the surgery will be a challenge given we have winter with lots of snow and ice until April sometimes. Our bedroom is also 14 stairs up off the main level, which I am not sure I will be able to handle for the first few weeks once home. I have been working hard building my leg muscles ever since being told of the operation date back in early January by riding my stationary bike morning and night 7 days a week. I ride between 10 – 12 km per day. I am a lot like Mark that when I go shopping with my wife I either have to stop and sit down after 20 minutes of walking or sometimes just go back to the truck and wait for her. My biggest challenge before the surgery are days that either one or both knees seem OK, which does make me (at times) question the decision for bilateral surgery. Then there are those days that I use my knees for an hour or so longer than I should and can hardly wait for the surgery. I find it is an emotional roller coaster between the good and bad days and continually question my decision to give up what God gave me for prosthetic knees. Both my knees have been damaged from many years of soccer in my younger years and having multiple orthoscopic surgeries to remove torn cartilage in both. I have been wearing a loaded knee brace during golf on my right knee for 4 – 5 years and I also find my knees are quite bowed now. Looking forward to one day walking the 18 holes and golfing with no pain. Again thanks for your efforts and time in sharing your experiences and in giving others the encouragement some may need, as I did. Good luck with your surgery, Bruce. It sounds like you are well-prepared. They told us at our pre-surgery meeting that if you needed to be able to walk up a flight of stairs, you would be able to by the time they released you from the hospital. I don’t know if that will be true for you or not. We were at Myakka River State Park in Florida recently and they had a lookout tower you could climb up over the top of the tree canopy. Mark went up, but I did not. When he came back down he said he would never have been able to do that before his surgery. He was not able to play gold before his surgery and now he can enjoy it again. So many things. Let us know how you do. Best of wishes. Here in Spain under the social security plan, they will not do a bi-lateral, I will have to wait for the second. My problem is I dont know which knee to choose because the doctors here say I have to decide….any suggestions ? I had left knee cartilage removal over 45 years ago, leading to damage in the right and another cartilage removal about 35 years ago. I have suffered chronic pain ever since now almost natural to bear, but no, it is getting worse and I am scheduled for TKR next week. Any suggestions ? Thank you for your blog. This has been great. I am going into it with optimism and I have always tended to heal well and I DO NOT WANT TO HAVE TO TAKE A LOT OF PAINKILLERS….time will tell and healing will convert !! I don’t have any suggestions regarding which knee to do first. I have known others who have had them done one at a time and seemed to do quite well with it. I think you will be very glad once you’re recovered. Good luck. Just make sure you use the best orthopedic surgeon, even one who is so good he does revisions for other surgeons mess ups. Take your norco an hour before therapy!! Good luck! Christine, I enjoyed reading your’s and Mark’s story of his surgery. I am having bilateral knee surgery April 1st. I am 63, had a hip done 1 1/2 yrs ago that went really well. I have a few anxious moments but am mostly excited to be through with all of this. I am in Santa Rosa, California, and am told that “they” do not use the CPM machines anymore, and I’m not sure how I feel about this. I have been working hard to get “quads of steel” and feel pretty good at my strength improvement. Following your blog has given me more insight than most articles I’ve read. Thank you very much for sharing this, and I am going to have my husband read it also. Thanks for stopping by, Kristin. I’m glad you found the blog posts helpful. I know everybody does things a little bit differently. It was something of a pain to use the CPM machine, so maybe it’s a good thing that you won’t have to. Good for you and your “quads of steel.” I know this will help in your recovery. Best of wishes to you on your surgery. I hope you will stop back and let us know how it all goes. Hi Christine, well, I am finishing week 5 after BTKR and quite honestly the jury is out on whether or not to recommend bilateral. I KNOW that when it is all said and done, I will be glad I did it, but right now….pheww. “They” say I am doing well, I was strong going in and feel pretty strong now…it is just that whole bending thing. I struggle with the “fear, pain & depression” triangle sometimes as I wait for normalcy. I think what is getting to me the most is that my right knee has developed a “clicking” …. of a muscle or tendon…on the outside of the knee. It hurts during cycling (when I push the ROM) or simply when I try to push the degrees more…I am at about 100. When it clicks, it is like an electrical shock that takes about 5 minutes to stop hurting. The Doc saw it and says be patient, do more swelling control, etc. It scares the devil out of me. I read that clicking happens, but no one in your blog has mentioned it and I’m wondering if anyone has had it. It is slowing down that side and adds to the fear. Generally, I am OK, optimistic, upbeat,have good support, but sometimes I think this is as good as it gets. I constantly have to work my mind as much as my body. Thanks for the outlet. I enjoy reading other’s experience. Who was/is your ortho and do you recommend him/her? Thank you! I don’t know if you’ve had your surgery or not. If not, best of wishes. If you have, I hope it went well and you are well on your way to recovery. Now I’m going to have to go back and refresh my memory about the “knee that clicks.” Apparently, if it once did, it has not for a long time. We live in Cincinnati, Ohio, so I suspect my husband’s ortho would not be to on your list. Many others have responded with positive experiences with doctors all over the country, and world, actually. I don’t know about “quads of steel,” but Mark does just about everything he wants to. (He doesn’t run or jump, but then, neither do I at our age.) He does kneel occasionally in the yard when he is working there, which I think was a prohibited activity, but doesn’t seem to trouble him. Just found your blog and it has been nice to read and compare stories. I had my TKRs on Ja. 24/27. My dr. Does them 3days apart. I was basically in the hospital for 6 days. I was able to take showers in the hospital about a day after each surgery. I was set up with a CPM machine at home, which I also agree was a lot of time each day but worth the time. I am doing great with bends (138-140 degrees) but struggle with my impatience of stamina. Pain the first two months was awful but feel like it’s getting much better, however I also got off my pain meds (using only IBuprophin) at 5 weeks because I didn’t like the way they made me feel. I pray my strength continues to improve and the pain diminishes. Congrats to Mark on his success. I never heard of that before. It sounds like you are doing well. Mark’s doctor did a good job with pain management, I think. Hopefully everything will just continue to get easier and better for you. It’s a big-deal surgery, but you are through the worst of it. Mark is so glad he did it. There is really no comparison to his life now. Thanks for stopping by. Christine, I am a 53 year old who had bi-lateral last Tuesday, March 11. I have a couple of questions if you don’t mind. One, my doctor sent me home with two DonJoy ice machines. I basically use them 24/7, but am hearing that other say that is way over-kill. Did Mark use them and if so, how often? Did he sleep with them? Secondly, I have not taken off my TEDS and was wondering if Mark was able to take his off for 30 minutes a few times a day? Or did he just keep them on 24/7 until his post-op and then was done? My post-op is April 2. Thanks for any thoughts. I enjoyed reading your blog before my surgery and it has helped me a lot mentally. I’m doing great in terms of walking, exercises, etc. But pain management has been really tough and I think the constant ice and TEDS are my biggest challenges. Thanks again and hope you and Mark are doing well. I’m sorry it took me so long to respond. We were out of town and I fell behind. If I recall correctly, Mark had one ice machine (cooler, really), but he had a “Y” connection so that he could cool both knees from it. I’ll ask him and let you know if that’s different. I don’t think he slept with them, but again, I’ll ask. He cooled one knee while he used the CPM machine on the other. I don’t know if you are using that or not. I’m not sure what the TEDS are? Are those the white hose? I know he took them off at some point, because I remember struggling to get them back on him at first, until he could do it himself. I’m going to have to get back to you about that too. I think the ice is important because it reduces the swelling which can cause pain and discomfort. We got little bottles of water and I froze them, then replaced melted ones, with fresh ones from the freezer and kept recycling them. That worked out really well. I hope by now your pain management has improved. Mark is doing tremendous, better than me, actually, as I haven’t had my arthritic knees replaced. But they aren’t as bad as his were, and I’m hoping to get by with them. I’ll talk to Mark and get back to you. I think you’ll find this was all very much worth it, quite soon. Mark confirmed that he did not use the ice machines at night, and otherwise he only used them about half the time on each knee, because he was on the CPM machine with each leg most of his waking hours each day at first. Thank you for this blog. Going through this July 7th. This has helped me. I’m glad. Good luck on your surgery. I was scheduled for a TKR on May 6th and the Dr. just recommended doing both..I am a little nervous.. I am having it done in Philly and I know nothing about any of the machines you are talking about. Do they supply them.. Did you get the higher toilet seat? Not all doctors use the same things. In fact, someone wrote that many doctors don’t use the CPM machine any more. I don’t remember how we got it, but I think the doctor’s office made the arrangements to have it delivered. The ice machine was a good thing to have. It’s just a small cooler with a pump and tubing attached to a pad. You keep the cooler filled with ice and water (we used frozen small water bottles that we could recycle in and out of the freezer) and it pumps cold water to the pads that you wrap around your knees. I think it helped with the inflammation a lot. You could ask your doctor about it. I got a higher toilet seat, but Mark didn’t want to use it. I probably would have used it myself if I had had the surgery. I would be surprised if you weren’t nervous. But as you can tell by many of the comments on this site, most people do quite well. Keeping up with the exercises and therapy is crucial. If your doctor has recommended you have both knees done, I imagine that means that you are really suffering now. If that is the case, you will be so glad you’ve done it once you’ve recovered. You will have your life back again. 72 and had bilateral TKR 3/4/2014. I have always been active….health club several times a week…all pre surgery exercises done faithfully. Released from rehab 3/22 (left with 105 ROM) with walker…I have had 3 wks PT home care and in my 3rd week of PT at the hsp (129 ROM today). I am so disappointed. The pain getting up is still very very painful, walking more than 40 feet is very painful, standing is almost impossible after a min. I am know as very committed and I just seem to be far behind compared to others. My dr and PT say I am doing great and it’s not unusual to take 3 to 6 mos. YUK! Thanks for stopping by Susan. I’m sorry you are disappointed. I know some people have a harder time than others with this surgery. It took my sister-in-law a long time to get the flexibility she was hoping for. I think your doctor and PT should know if there was something more wrong. Don’t give up. But if it continues to hurt you, I would definitely be the squeaky wheel with the doctor, because sometimes things don’t go quite right. I hope you are feeling better now and continue to improve. Check back in later to let us know how you are doing. Best wishes. Hi thd blogs have really helped. K am scheduled for bi later knee on May 28th. I am so nervous,not about the actual surgergy per se, but the pain in recovering. I am a rather large person, yet motivated snd young at heart. I will be 52 in June. Cant imagine not having a good leg tp stand on although its not really good at all. Question did ypu wear sneakers for rehab. Im npt really a sneaker person, they feel so heavy and hot on my feet, any other suggestions? You are young for having this surgery, as was Mark. That should help you some, I would imagine. I think Mark did wear sneakers in rehab, but I think any good walking shoe with non-slip soles should be fine. I hope it all goes well for you. Let us know how you are doing. Hello its been 5 weeks post op. Only problem has been terrible muscle spasms in left leg, I woke up from surgery complaining and have been back to the hospital to make sure of no blood clots. Has anyone else experienced this? It holds me back from excercising,. I was at 98 bend now its 88, I sure don’t want to be moving backwards. Right leg is wonderful bending 110. I named my legs, frick and frack. Frack, the left leg is wack, lol. Mary, I was 54 when i had bilateral knee replacements in 4/2013 and am considered morbidly obese and i was able to do all of the rehab with no problem. As I found out later, the tendonitis I was experiencing during rehab and to this day is because my ligaments stretched out. This doesn’t happen very often so don’t worry about it. Make sure they give you your pain meds an hour before therapy and ice your knees after!! Good luck! thank you Mary, I’m the same as you and wondering if I”m making a mistake doing it when I’m obese, but I cant exercise even on a stationary bike without a flare up that leaves me unable to walk. You have given me hope. Thank you. I am set to have my surgery 6/11/14. My daughter is in nursing school and is scared to death that I want to do both at once. I was an OR nurse and I have have past surgeries and can psych myself up for this. My doctor has recommended this for me as he says both my knees are bad and it’s hard to choose which one is needed over the other. Thank you for your blog. I know now I am not crazy. No, you’re not crazy. As you can see by many of the comments on this blog, you’re not alone either. Most people who have checked back in with us here after there surgery are doing well and glad they did it. I know Mark is. There is simply no comparison to what he is able to do now from before. I don’t know if you read any of the “before” posts, but we went to a pre-op meeting where we were told that Mark would be able to do everything he needed to do by the time he went home. I found it hard to believe at the time. Just do the exercises they tell you to do to prepare yourself. You probably will have a few rough days afterwards, but it won’t be that long before you reap the rewards. Good luck and let us know how it goes for you. Hi Christine: Thought I would give an update after my Feb 3/14 note above, I am 62 and had Bi Lateral surgery on Feb 11/14 here in Calgary Alberta, Went home after 4 days, My surgeon here in Calgary believes in “passive” PT by the patient only at home and no therapist. Used the Polar Kodiak ice machine faithfully 24/7 to control swelling for at least 2 months on both knees. A must do I believe!! Went back to my office job in 5 weeks. With it now 3 1/2 months after surgery my right knee which has a much more restrictive implant is better than new, although still covering and swollen at times when I over use it, but zero pain. My left knee with a normal implant like Mark’s, I am still having some pain to the interior of the knee and I do get the click sound from a tendon on top of the knee cap when doing stairs. I am about to try golfing in a few weeks to see how that goes. I too have a clunking sound from time to time but everyone tells me to be patient. Although still recovering for another few months yet, Bi Lateral is the best thing I ever did and I recommend bi lateral for those that are questioning both the same time. Patience is virtue people say and with knee surgery it’s a requirement. I’m happy to hear you are doing so well. Most people who have responded have also have good success, although every now and then someone struggles. I’ve never heard of a more restrictive implant and would be interested in hearing more about it. I’m sure your golf game will be much more enjoyable now than before when you were in pain. Thank you for taking the time to let us know how you’re doing. Best wishes. Christine. Having had bilateral knee replacement five weeks ago,I am so surprised as to how quickly I am recovering.I am 65 years of age and was expecting a much harder recovery, my husband insists that a positive attitude helps greatly.having spent 2 nights in hospital the Dr’s advice was that motion was his advice,so I did as he said, one week home,out went the crutches ,haven’t seen them since,icing lasted two weeks,still wearing compression stocking,as the Dr recommended wearing for 6weeks,no swelling since the icing.I returned to house duties once I got rid of the crutches week one.It was very slow at first,but I was determined that I was going to followDr ‘s advice.The only PT I’ve had is the ones I had at the hospital,plus the booklet that was given on knee exercises that I door,i found that the exercise bike has been the best exercise for your knee.Of course keeping on top of the pain is super important,I have cut back on the strong medication to a chemist line medication.So at this stage I do lot and lots of walking,initially after DR advice I would walk around the dining room table, slowly at first till I was quite comfortable and no discomfit,I now go for long walks including up and down a small hill ,I am so happy with my progress,I have 120 degree bend in my knees ,so happy,occasionally my knees get tight,so on the bike I get ,relief is almost immeately. Can I just say the choice of your Dr is very. Important in this major operation,you must trust him,and follow his advice,oh! By the way,when you make your decision to go ahead with your operation ,as i did,did not read any any negative blogs and did not discuss my decision with friends as the soon start you off with negative we’ll meaning advice.Just keep your family informed. once the op is over,and your in recovery,then check on your expected recovery. then I found the internet was very informative. Thanks for stopping by and sharing your experience, Regina. I’m glad things are going well for you. I agree that the choice of doctor is important, but unfortunately, it’s not always easy to know who is actually good and who is not. I hope your recovery continues to go smoothly. I had my bilateral knee replacement on July 7th. They let me take a shower today! I am moving around very well. Pain is a toughy, but making it through. At 58 yrs old, I am very happy I chose the both at once route! I’m sorry I didn’t get back to you sooner. It sounds like you are doing quite well. Is the pain getting better for you now? CM, jus a belated thank you for your Bi Lateral TKR experience from a couple of years ago. I’m just starting week #4 and with a couple of minor exceptions, my experiences have been amazingly similar – can’t tell from the pictures, but I may be a few years younger than Mark but your blog has given me a great reference point for my own experiences. Thanks again. You’re welcome. I’m glad it was helpful to you in some way. Mark was 55 when he had the surgery. I’m glad everything is going well for you. I had my bilateral knee replacement on July 7th. 4 weeks ago. It is going well. 102 for my left knee and 108 bend on my right. Everyone seems pleased. I must say, rehab, rehab, and rehab! Thanks Mary. I’m glad you are doing so well. And I agree with you about the rehab. Hi Christine thanks a lot for sharing your husband experience. 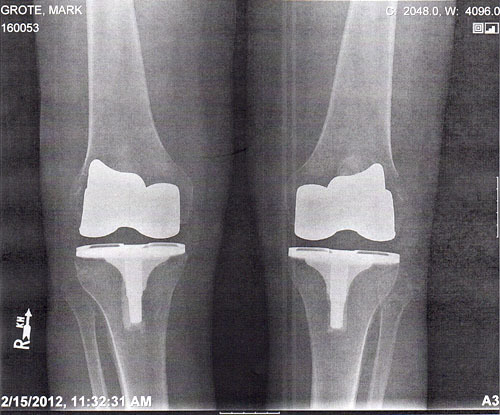 My husband is 68 yrs old, diabetic and a couch potato… he will have bilateral knee replacement on August 21. His cardiologist gave him the ok but I am very concerned that he can’t recover well for his lack of shape/ exercise. Hi Vicky. I hope your husband’s surgery goes well. I think it is possible he will end up in better shape following the surgery than going into it. The rehab may snap him into shape. I wish you both well. Let us know how it goes. I had both knees replaced at age 50. My knees were terrible so it made sense to do both. After 7 days I walked without crutches, quit the pain meds after 8 days, drove to work at 14 days & started biking the streets of my city after 18 days – 40 minutes per day. I bowled 12 games consecutively after 30 days, and at 45 days am 90% recovered. I never did formal PT – except the constant motion machine for 6 days post surgery. I did the rest myself. After 4-5 days I had no pain in my knees – just swelling and stiffness. It is 75% gone now – and in 3 more months I should be 100%. Thanks for sharing your story, John. I’m glad everything went so well for you. I was amazed at how quickly Mark recovered too. I hope your recovery continues well. I’m sure it will. What a wonderful discovery this blog has been!! I am 36 and going to the hospital in a few weeks for the same bilateral procedure…I AM TERRIFIED, but looking forward to being pain free…THANK YOU A MILLION TIMES OVER!!!! I feel much better after reading this!! You’re pretty young to have to have this surgery. I guess that’s bad and good. It’s bad that you’ve had so much trouble so early in your life. It’s good that, at your age, you should recover pretty easily. And then you can enjoy your life a whole lot more than you probably have been. Best of wishes to you. Let us know how it goes. I had surgery for bi lateral knees on the 19th June 2014. I am back riding my bike both stationary and moving on my left leg I have 135 degree band and my right 125 my physio are stocked as am I . it has been fairly easy dare I say ..and for me not a lot of pain ..I live 100ks away from Perth where I had the op done and was lucky in the fact that my mum lives there and I stayed there for 5 weeks after the op because I had an appointment with the specialist at 5 wks and would have cost a fourtune to fly home the back then home again….I ididnt do much in that first 5 weeks lots of resting tv and my physio 3 times a day. by the second week I was doing the floors for mum (she is 87 ) and the washing nothing else. I had no trouble with mobility and some times wasn’t using the crutches. I hasn’t been a bad experience for me and its 3 months in a couple of days the numbness it starting to wear off . I am off to new Zealand in 2 weeks for a quick holiday so hope the knees hold out. if I can help and you have any questions let me know. Good luck. I am encouraged by you report, Stephanie. I am nearly 71 and after 4 yrs of cortisone treatment on one knee and less on the other, am scheduled to discuss BKR w/ surgeon on 10/15. My goal is to be able to fully enjoy a largely walking trip in Europe a year from now. Am fairly active, go to Pilates and do weight training once a week, have “amplitude” but am not obese. I have discipline, have always healed fast, and expect to get through this as well as anyone. My biggest concern is surgeon may say one knee is not ready yet. I don’t fancy doing the replacements in separate surgeries. Thanks for your report! Keep up the good work. Thanks for sharing your story Jan. I’m glad you’re doing well. Thank you for taking the time to share your journey with us. I will have my surgery two weeks from now and I am nervous as can be. I was also informed that I would be giving myself blood thinner shots on my stomach daily for a period of six weeks! Did you have to go through that as well? Mark did have to give himself shots in his stomach, but I don’t remember it lasting for six weeks. And his shots were not like what you think of as a shot you get by a nurse at the office with a syringe and a long needle. They were more like a pin prick or poke. I worried about having to give them to him, but he did it himself, and it really wasn’t all that bad that I could tell. Good luck on your surgery. Let us now how it goes. I just had surgery a few weeks ago….I had the blood thinner via needle while in the hospital but then took pill form after I got home. Just had bilateral knee surgery 18 days ago (Sept 16). I’m 51 and it’s the best decision ever made. So glad I didn’t do them one at a time. I have had little to no pain since the surgery. Pain level even the night of surgery was (on a scale of 1 to 10) between 0 and 2 and has remained that way ever since. I’ve been off all pain killers for almost a week now. PT is relatively easy – no pain there either. Every day I see more and more progress. Would definitely recommend both at once provided you have a good surgeon and so long as you are reasonably healthy. Wonderful. Lucky you. I would just repeat the caution that Mark’s therapist gave him: don’t overdo it and end up back in the hospital. Life has probably just gotten a lot more enjoyable for you. I am scheduled for bilateral knee replacement in 5 weeks. They talked about the CPM machine, did your husband just take turns with each leg and just keep switching or did he have two machines going at the same time? My doctor hasn’t done both at the same time, but after a lot of research I insisted that is what I wanted and he is willing to do it. I am 49 years old, have been doing injections for a couple years, but it just isn’t working anymore. All the cartilage is 100% gone in both knees, it runs very heavily in my family. At this point every step is painful! Looking forward to being able to walk normal again! Mark had only one machine, and I’m not really sure you could fit two machines side-by-side and that would work. I pretty much had to take care of moving the machine to and from the bed and helping him switch them out at first, although I think if we would have set it up in the spare/guest bedroom in the middle of the bed, he could have managed on his own. We kept it in our bedroom where I had a tray with snacks and his drink set up beside the bed and a nice TV with dvds to watch. We spent a lot of time in there at first. It runs in my husband’s family too. He can easily outwalk me now. Best of wishes on your surgery. I Love the admiration I hear in your description of your husband’s recovery, but I wish I could hear from him how he motivated himself to do the painful PT stretches. I want my new knee to be straight and healthy, but can’t stand the pain of the staightening and bending exercises 3 times a day. Sorry it took me so long to respond, Peggy. Your message got lost in the fray. I’m sorry to hear that you were struggling, and I hope things are better now. Truthfully, I don’t think Mark had a lot of pain. I suspect everybody responds a little differently. It could be that Mark’s muscles were just naturally more flexible. I will ask and see if he will respond. He isn’t very chatty on the web. Thank you for your blog— so few people have both knees done at once it is hard to find information and stories of experiences. Everyone told me I was crazy, so I greatly appreciated your story. I had bilateral knee replacement on Sept 3, 2014 and have had great success—so glad I did them both at the same time—you get out of it what you put in to it. Thanks for sharing your success story with us. I am just reading this post with interest, I am 51 and unfortunately my knees are now worn out after several sporting injuries earlier in life. The surgeon said to me that while he does not really like the idea of replacing knees on a patient my age, the condition of my knees leaves little choice and I am booked for the surgery on the 14th November 2014. I have noted several of the posters are even younger. I feel for them. How old was Mark when he had this done, and how is he now progressing a couple of years down the track? I admit that I have been quite petrified of the procedure and reading your experiences has lightened that load a little. I am told by my surgeon that I will be in hospital for 4 to 7 days, then I will be sent to a rehab unit for about a week before going home. Interesting the surgeon said that I will have 2 CPM machines going for 6 – 7 hours a day. Hopefully this will make it a little easier than having one and changing it. I hope your surgery went well. Mark was 55 when he had the surgery. It’s changed his life. Let us know how you are doing. Had the surgery done on the 14th as planned Now 11 weeks ago. In the end I had a single CPM they just changed it over, 1 Hour per leg twice a day, sometime 3 times. The surgery was done on a Friday afternoon and it all seemed to go well. By the Monday I had both legs bending to 100 Degrees in the CPM. it was a push but manageable. I was up walking in a frame and onto crutches within a couple of days. I did not need to go to the rehab unit as I had exceeded the requirements and was allowed home after a week. I continued the Physiotherapy at home and I also also did (and still do) a lot on my own. The initial pain was less than i expected, although my left knee pain was certainly more intense than the right. Since then the right knee (which was the one that historically caused most problems) has steadily improved to the point where I barely notice it at all. The muscle has grown back very quickly and the strength is still returning rapidly. The left knee on the other hand has been very slow! It is still quite painful and causes me to walk with a severe limp, it still causes quite a lot of pain at night and any lateral movement is very painful. The surgeon says that it “should” settle in time and the “full” recovery time is generally 12 months. My problem is I am not confident that he is correct and feel that there is something “not right” in the left knee. I hope like hell I’m wrong. I see him again next week, I’ll try to keep you posted. I hope your surgery went well and that you are recovering. Let us know how you are doing. Thank you so much for your amazing blog and your dedication to replying to every single comment. I have suffered Rheumatoid arthritis since I as 4 years old and at 46 have decided its time for the dreaded bilateral knee replacement. As I move closer to surgery I am researching so that both myself and my husband can be as prepared as possible. So many people have had such great results .. and the key sounds like its the therapy from day 1 and a great optimistic outlook. Before reading your blog I was a little scared about the unknown… now, I feel like I will have a tough road ahead, but with dedication and determination, its going to be absolutely fine! Thank you for sharing your and Mark’s journey. Thank you for taking the time to comment. I don’t know if you’ve had your surgery yet or not. If you have, I hope all has gone well and you are recovering. Not only Mark, but all the others who have read and commented her on this blog have had great success with their surgeries. I imagine you will too. Best of wishes. I hope you are doing very well post-surgery. Twenty years your senior, I am scheduled for bilateral surgery on 1/8/15 and like you, will have 2 surgeons to keep the procedure to about 2 hours. How are you doing now? I’m curious as to how much time you spent in the hospital and the rehab facility. Best of luck! Best of wishes for your upcoming surgery. Mark had his surgery nearly three years ago now. You would never know he had the surgery by his activity level. He is doing great. After the surgery I think he spent three nights in the hospital, after that he came home. He did not go to a rehab facility, but went to rehab several times a week. I was here to help him so he was able to come home. Let us know how it goes. I had Bilateral knee replacement on July 7th 2014. I was in the hospital for 3 days and in rehab facility for 3 weeks. I am a 58 yr old female. Best decision I ever made! All I can say is work hard in rehab, as it will make life much easier. I was cleared to go back to work on November 10, 2014. Would of been sooner if there was light duty available. Best of luck! Quick question after having Bilateral knee replacement, can you ever take a bath…or is it showers forever? Sure. Why not? I think the only things Mark is not supposed to do are run or jump. I think he is supposed to avoid kneeling, but there are times he does. Thank you so much this has been most helpful. Jan 8th is when I go in to.set the date for bilateral knee surgery. I’m scared and excited. More then anything I just want to walk and workout again normal. Thank you for doing this. Thanks for stopping by. I’m glad you found this helpful. I see your date is almost here. That’s good. The waiting is hard. I think you will be pleasantly surprised by how much better your knees feel after you recover. Let us know how you do. Your blog was great. I’m 61 and doing both knees on February 3rd. They never said anything about having the machine at home to move the legs. Was this something you requested or just your doctors procedures? How old was your husband when the surgery was done? The machine was something that Mark’s doctor did. I have since heard that a lot of doctors don’t require that anymore. That’s probably a good thing. It was a pain to use it. Mark was pretty well confined to bed for most of the day. Mark was 55. He is enjoying life to its fullest now. Best of wishes on your surgery. Let us know how it goes. Sorry about my last question regarding age. 55 I got now. Another question though, how important was the elevated toilet seat? Very important! With bilateral knee replacement, will be tough up and down on the seat. Bars will be helpful to hold on to as well. My husband installed one for toilet and also shower. My surgery was 07/07/14. Thanks for the great blog, best I ever read and also now follow, since my surgery for bi-lateral knee replacement is on March 16th this year. Reading all of the experiences has calmed me down somewhat. I think one thing that is so hard to deal with is all of the comments from friends, family, co-workers regarding bi-lateral surgery. People in general are very negative about this and that had gotten me scared like nothing else. The reason my doctor recommended and wants to do bi-lateral surgery is that both of my knees have been diagnosed as end-stage arthritis and doing the pre-surgery exercises has been very hard for me. Also, knowing that I need both knees done and having it done once seems to be a huge savings in terms of rehab and recovery efforts. It truly helps to read some of the positive posts on this site and I feel better about doing bi-lateral, because the only people who really know about this is the people who have gone thru it, both as spouses and as the patient. One thing for sure, Christine, Mark is amazing and I hope to follow in his footsteps. It has encouraged me to feel the pain of my exercises but to keep right on going. I purchased an exercise bike and I am determined to do before and after exercises as well as I can. To be completely honest, this surgery scares me more than anything I have ever gone thru, not sure why. I am a 54 year old female and had breast cancer at 46 years old, undergoing 10 surgeries, chemo, etc. for 2 years. It was hard, but having to face my knees being replaced feels like the scariest thing ever. Dear friends, who are reading this, please pray for my speedy recovery as I will pray for yours. Thank you, friends. I was pretty scared, too, Crystal. And I wasn’t even the one having the surgery. I think the thought of it is worse than the actual experience. I hope you have an easy go of it too. As you might be able to tell from reading the comments, most people have had good experiences, but some have struggled. Let us know how you do. Best of wishes. I have now had my double knee replacement. Today is 17 days out. I was well-prepared and all, but to me the most difficult thing was dealing with post operative nausea for 2 days in the hospital, once that was controlled it was better. The other intense thing I experienced was severe constipation for 12 days, this was no easy task to take care of and required lots of attention. The Colace that is prescribed does not work on its own with all the heavy meds that run through a person’s system, so it is wise to purchase Miralax and take daily. In addition, I used 4 Senokot tablets per day with the Colace and Miralax. You may even want to go,as far as also getting Dulcolax Suppositories, I cannot stress enough that this could be a serious problem for many. I decided I couldn’t wait. Am having my surgery 16 February … just two weeks away. Our house is prepped, exercising regularly, pre-op pt in progress. Scared but excited. Our ‘Joint Program’ is an Enhanced Program.. I’ll be out of bed with a walker within 2 hours of coming out of recovery, they don’t used general anesthesia but deep sedation (with spinal block and a series of nerve block shots in the knee’s. Also will have a device that will collect, filter and return blood to my system for the first 24 hours. I’ll have CPM only while in the hospital and also a cooling pad/machine. Good luck with your surgery. It sounds like you are highly motivated. Mark also had the blood returned for 24 hours. I think that worked well. Let us know how you do. Best to you, it sounds like your mindset is there and you are well prepared. I think we are all scared of this surgery, but at the same time we really know deep inside that it will improve our lives afterwards. My surgery is not until March 16th and I knew of this date as early as January 7th, so you can imagine all the thoughts going thru my mind. The best thing that I find, is to do all that you can and focus on those exercises and not think about it too much. How did your surgery go? Have not seen any further posts by you. My surgery is set for March 16th, bi-lateral as well. My surgeon is so busy that I had to wait a couple of months. I was very nervous at first knowing that I will have to get both knees done, but reading your blog has helped me a lot. At first I was depressed and feeling sorry for myself, the “why me” syndrome, then I embraced the thought of maybe finally having knees that work. I was born with chondromallicia patella and always had bad knees since I was a child. I had difficulty running, and playing sports for as long as I can remember. I am 54 years old and there was some concern to have this done now, but I was diagnosed with end-stage arthritis and one of my knees is bone-on-bone, so I do not feel that I have the luxury to wait. I am preparing and have joined a gym in my area, knowing that the exercises will help me after surgery, I have been working at it the best that I can. I asked my physical therapist about the CPM machine, but he said that he thinks that Kaiser is no longer using it. I heard that patients were using the machine instead of actually doing the work, but I think that this machine sounds too good to be true, I hope my doctor will see it that way too. It is inspiring for me to read about experiences of other fellow knee replacement patients since it gives an account of what to expect. Thanks for all this support, it is a lifeline and I am so very grateful to have it. I will report back once I have had surgery. If you read through the comments, you will see that some people use the CPM and others don’t. I get the feeling it is on the way out. Good luck with your surgery. I look forward to seeing how you do. I hope you have great results. My surgery was on March 19th and went very well. My stay in the hospital was 4 days. Thanks to your lovely blog, I was well prepared. I went directly home after my hospital stay. This was nice because my hudband was able to take great care of me. The therapist visited me at home and I got my exercises. I think for me the first 2 weeks were very hard to get around, but going into the third week post surgery I feel so much better, in fact, I think every day there is improvement. At this point I am very happy that I had this surgery. Today my therapist even put me on my stationery bike and I was able to go a few rounds. I am 5 years post bilateral knee replacements and highly recommend having both knees done at once if your doctor recommends it. I was in the hospital for 3 days and then a rehab hospital for one week. The rehab hospital was great. I was scheduled most of the day for physical therapy and occupational therapy. The laundry room was across from mine, so I did laundry for other patients — counted as part of my occupational therapy. (There were stroke patients with busy family members that had been dragging dirty laundry home with them). My pain was controlled with medication so that was not an issue. Once I was home, I had a nurse come to my home twice a week and a physical therapist visited three times a week. The physical therapist was a great match for me. He had me on a bicycle the second week and also walking outside with a cane. Once I was home, I really didn’t use the walker or the cane unless the therapist was there. Frankly, I would forget it in the other room and didn’t see much point in going back to get it. We were so over-repaired for coming home after surgery. We live 10 miles from our small town and 40 miles from a major town, so tend to over purchase everything. My husband even purchased a used wheel chair, which we never used. He was concerned about getting me into the house because we have 5 steps to our home. Well, I climbed slowly up the steps without a problem. Our best purchase was risers to place under our sofa legs to make it easier for me to rise. We got the tall ones that looked ridiculous, but worked wonderfully (Bed, Bath and Beyond). We already had the raised seat for the toilet and that is an absolute must have. My husband worked in the neighborhood and would bring me soup for lunch and check on me. I really didn’t need anyone to look after me on a full-time basis. I was able to get up and go to the bathroom, get myself a snack or a drink without a problem. I don’t remember how many weeks I had PT at home before starting PT at a facility three times a week. My husband drove me because I would take a pain pill prior to PT so that I could participate fully without pain. At the PT facility I would first hop on the bike for 15 minutes prior to therapy. I was a wiz at that and they were all very impressed. I watched a woman come in for her first therapy session, try the bike and couldn’t even make the pedal go around once. She was only a single knee replacement. I receive PT at the facility for 8 weeks (only because I insisted), I wanted to do PT until I returned to work. Figured I might as well keep at it while I had the time off and could take advantage of the help. I did extremely well with having both knees done at once. Like I said, we were so worried and over-prepared but it all worked out fine. I was afraid my husband would let me starve, so I had stocked the freezer with microwave meals. But, he did a very good job of taking care of me. He did so well that I brought him a Sony TV for his garage for him and his friends to watch football games. It wasn’t long before I was back to making their “snackies” for their get-to-gathers. I took longer than most off from work because I had decided to baby myself and not rush things. I did not draw any disability, so figured it was my business. I was due to return to work and asked to extend one more week. When that week passed, I was absolutely ready. I know that others return quickly to work, maybe they are ready or just need the money. Fortunately I was able to stay home because I knew for quite some time that knee replacements were in my future, so I was prepared. In March 2013, my son and I went to Kenya on safari. Recently, in November 2014, my best friend and I took a river cruise from Amsterdam to Budapest and had a wonderful time. I choose not to go on one of the excursions to a castle because the terrain was so difficult. My friend confirmed that I was correct in avoiding that visit. Otherwise, I have been getting along fine. I am careful to use hand railings when possible and careful on those damned cobblestones all over Europe! I am 66 years old and hope these replacements hold up! Good luck to all of you with your knee replacements. Thanks for sharing your story Jackie. I think the success stories are a comfort to readers who are searching for experience with this surgery. Thanks for the to about elevating the sofa! Wow, no pain at all. Can’t even begin to imagine … We’ll call you Superwoman from here on out. I have 5 days to go before my surgery on the 16th. I am in very good shape too, do my daily workouts, etc.. I’m not expecting to feel no pain – though I am very optimistic and determined to do what needs to be done to heal quickly … congrats and hope you enjoy your trip to Europe. A CPM machine was not recommended in my case. My surgery was performed at Scripps Green Hospital in La Jolla California and they do not prescribe the CPM for their patients. Maybe it is a regional issue because I do not know of anyone in my area that used the CPM. I thought the surgery and recovery was much easier than I anticipated. In fact, it was quite easy — the PT was actually fun, especially the occupational therapy and I was surrounded by such great people. Everyone took such great care of me. My nurse at Rehab would bring me a Starbucks when I first woke up each morning. I did not like waiting to get coffee with my breakfast. I called her my angel. Yes, my hospital had a Starbucks in the lobby! Every morning my surgeon, his orthopedic nurse and the Fellow from Boston appeared at the foot of my bed all wearing white coats– it was very impressive. My roommate thought I was someone very important! I was very luck to receive the care that I did. Insurance in California no longer allows recovery in a rehab hospital but sends patients to a skilled nursing facility. I must admit I had one bad day at the rehab hospital where I was just tired out, but the therapist kept pushing me until I cried. He came back later in the evening and had me to some exercises in bed to fulfill the requirements of the day. We all have our breaking point. It’s funny, I was in the hospital on Super Bowl Sunday, so it has been exactly 5 years since my surgery. My husband arranged to have my best friend spend the day with me, so he could enjoy the game with his friends. My biggest problem was constipation due to the pain meds. I ate prunes, drank prune juice, had syrup on pancakes, drank coffee — but still needed help with a suppository. You know how it is at a hospital — they always want you to poop. I realize that every case is different, but follow orders and everything will hopefully go well. So glad you had a good experience with your recovery, Jackie. I’m glad you mentioned the constipation. If the truth be known, I think that was Mark’s biggest problem too. Jacky, I too am looking at the Scripps Green hospital. Which doctor did your knees? I just now saw this — I was reviewing comments by others. My surgeon was Dr. Ezzet — I think that is the spelling. Scripps Green Hospital is the absolute best! I went to Scripps Encinitis for Rehab for one week. I’m at jjhiss@cox.net if you want direct information. Hope I am not too late in responding. Dr’s in laredo told me that I need knee replacement on both knees.but I’m just 51 years old and they said that they can’t do nothing because of my age. My name is Ramiro del bosque Jr from Laredo tx. I suppose all you can do is wait, or perhaps try to find a doctor who will go ahead with the surgery regardless of your age. I know the knees have a limited lifespan. Best of wishes. Christine, Thank you very much for blogging about Mark’s bilateral knee replacement. It will be SO helpful to have your experience to reflect on as I prepare for my own surgery in May. I especially appreciate the sensible, seemingly ‘little’ things that I hadn’t considered – like taking a notebook into the hospital to record my meds and having a second set of hands at home on the day I am released from the hospital to help my husband help me… so obvious, yet something I hadn’t considered yet. Yes, your blog is making a difference. I hope you and Mark are enjoying preparing for Spring! Im scheduled for bilateral knee replacements on May 4 & 7 2015 and am now wondering why my doctor isn’t doing them both on the same day?! I don’t like the idea of having to “go under” twice if it can be avoided. I’m a lap swimmer and only 50 yrs old. We too have a bad history of severe osteo arthritis in the family and for the past couple years I’ve been in so much pain I avoid doing everyday activities. Just started pre-Hab PT and can’t wait to be able to get this past me! Thank you for sharing such a positive story. It helps curb the fear! I think some doctors are not willing to do both at the same time. Mark’s doctor alluded to the fact that insurance companies wouldn’t pay as well for the bilateral. I don’t know all the ins and outs of it. I would hope doctors will do what is best for the patient. Best of wishes with your surgery. Thanks for posting this my husband is having knee replacement on April 7th and I have had a lot of anxiety about the months ahead. Your story has helped me to have a more positive outlook on it. Although I’m still scared of what’s to come it helped to read this and know I’m not the only person to have these feelings. I hope you both have an easy experience. Best of wishes. Not only did I record my meds, I took a timer that had an hour and minute timer. Some pain meds are prescribed as needed. So, if you don’t request them, you don’t get them. I would set my timer for 4 hours and request my pain medication. I also would write down the time I requested the medication because sometimes the nurse would not respond and if 15 minutes went by, I made a second request. Do not go without your pain meds because it is difficult and may take a day to get your pain back under control if you miss doses. Good luck! I had both knees replaced January 15th. Reading your blog beforehand really helped me. It was because of it that I believed I could do it. And drove me to succeed. One thing that really stuck with me was when my son told me that with a knee replacement “It doesn’t hurt to hurt when doing the exercises.” This means that no matter how much it hurts to do the exercises. You cannot do anything to hurt your new knees. Basically the only thing that can hurt them is if you kneel down or fall on them. So make sure all your paths are free of everything. Little dogs, toys, rugs, etc. My son, who just graduated from Nurse anesthesia school, stayed with me for two weeks after the surgery. It was really helpful to have someone who knew about drugs to see to it that I was drugged up properly. I had two ice machines running pretty much twenty-four hours a day for the first 8 days. He would take them off so I could exercise and go to the bathroom. Then I used ice packs once and a while. We found it was very important to make sure I took drugs before each exercise session and especially before the PT guy came to the house. We also discovered that I would become really depressed and loopy if I didn’t get outside for at least 15 mins a day for fresh air and sunshine. I did the exercises they told me to do three times a day to the max. everyday. I didn’t have any pain at all as a result. I was down to one oxy before each session and two at night after about a week at home. I had more of an ache at times. But it was nothing that I couldn’t deal with. At three weeks I was able to go up and down the stairs at my house twice a day. And I could drive in our little village. After 5 weeks I was walking without a cane and the doctor released me to do whatever I wanted as long as I didn’t use the drugs. At 6 weeks I was back to work. I clean houses. So I would work for a bit and rest for a bit. At 7 weeks I was working 4 hours at a time without a break. At 8 weeks I was back to a normal working day. As of now I ride my exercise bike for a half an hour three times a day and do stretching exercises when my knees feel a bit tight. I still make sure I use a hand rail going up and down stairs. And I have to make sure I am walking properly. Before the surgery I had developed a sort of waddle walk to compensated for the pain in my knees. My grandsons call me Super Woman with robot knees. I truly regret waiting so long to get the surgery. Thank your husband for me. He was a real inspiration. Thanks for sharing your recovery timeline. I think it helps other readers who are looking for reassurance. I’m glad you had a positive experience. I know the thought of the surgery is frightening, but most people have a new lease on life after recovery. I am having TKR soon. 68 yr old female, work out regularly–spin and 2 times a week with a personal trainer. Had a cartilage transplant a number of years ago. Doctor would have a resident do the surgery while he is present…should I just schedule a non-resident day? Very active, good health..but still fear the pain. I apologize for my delayed response. I suspect you’ve had your surgery by now. I don’t have any advice regarding doctors. I hope it all went well for you and you are on the road to recovery. Thank you so much for all of this information! I have 4 days until I am having bilateral knee replacement and I am excited but nervous! I am in so much pain now having to take dr ordered pain mess just to sleep. I am 60 years young and have been waiting for 2 months for surgery, I will not have that machine you speak of due to my surgeon doesn’t like it, but will have 4-6 weeks of in home PT. I will come back for an update after my surgery which is May 20, 2015, again thanks for all the info it helps so much! Good luck with your surgery. You have good days ahead. Hello Christine. Thank you so much for recounting Mark’s simultaneous bilateral knee surgery. I am facing the same, and I hope Mark realizes how lucky he is/was to have you by his side. I have the added challenge of living on a small island in the middle of the Pacific ocean, so I must travel to the mainland, as the few doctors here have no experience or confidence in the double procedure. I’m curious how Mark is doing now, 3-1/2 years out. I have other questions but will wait to see if you reply to this one. Best regards! Sorry for the delayed response, Livit. I don’t know if you’ve had the surgery or not yet. I’ve had other readers tell me they needed to travel to the mainland for theirs as well. Mark is wonderful. He doesn’t ever seem to be limited in his activities because of pain in his knees anymore as he used to be. He does pretty much whatever he wants. This is most noticeable in the yardwork he does here at home where he lifts heavy bags of mulch, yanks out difficult weeds, gets up and down to work in the dirt, walks up and down hills. Often he works on his knees. He doesn’t run or jump anymore, but otherwise, I think he is at least 100%, and certainly much improved from the weeks and months prior to the surgery. Best of wishes. Responding to the question about having the resident perform the surgery. I am certain they aren’t discounting your surgical fee – – I would feel much, much more comfortable having the experienced surgeon perform the surgery. The resident would probably be just fine, but for my peace of mind, I would need the surgeon. I had bilateral knee replacements and in any surgery I always check out my doctor for his experience and reputation. I was the first patient my gyno-nurse every examined, I participated in a HTN/diabetes 8 week tests for my doctor, so I have let my doctors experiment with me — but NOT on knee replacements. Good luck, you will do fine either way — I just don’t allow for any doubt in something this important. You have doubt, or you would not have posted the question. Hi, didn’t read your entire blog yet but since you have been through the knee replacement process I am just wondering before hand if they suggested other treatment options in order to avoid surgery? I’m Currently in physical therapy and they’re also taping my knee. I’ve had knee problems since I was eight years old. I’m now 49 1/2. I’ve had crunching and grinding in my knees and I cannot squat, kneel or climb stairs without a lot of difficulty. I’m too young to be like this yet i’m not sure that they’re going to do a replacement just yet. They talked about doing a lateral release. However I think they will try other nonsurgical options but since I’ve had any problems my entire life I have found physical therapy is good and it helps you gain strength but for me it is only ever put a Band-Aid on the problem and not fix the underlying issue. Just wondering if your md offered other options besides surgery? It’s not that I’m interested in being in the OR a lot but if that’s what fixes the problem then it has to be done. Im ready to operates both knee replecement..n in hope..i can bear the pain..
Hopefully you will get pain medications that will help immensely. Mark didn’t really have much pain, although I think some people do. the therapy and leg strengthening exercises are essential. Those individuals who really need the surgery, as I suspect you do, are in chronic pain. Mark is not anymore. Ever. Best of wishes. Thank you so much for sharing your husband’s experience with bilateral knee replacement, your blog has helped me immensely. When learning I am having both knees replaced, the reactions from others have created a lot anxiety for me! I usually am asked, “Are you sure?” Then the person tells me of a friend or relative that had double knee replacement and had a difficult time. People also comment that I am too young to do this! My surgeon doesn’t agree! I’m only 55, but my knees have been bad for about 7 or 8 years! I am also having my surgery on June 22, like Rohsni is. VERY SOON! I will be honest, I am pretty nervous about it, however reading about your husband’s experience is helping me a lot. Thank you again for taking the time to share your experience, I’m sure your blog has helped many people just like me prepare for this surgery. I’m glad you are finding the blog helpful. Mark also was only 55 when he had his surgery. I think the implants they use now last a longer time than they used to. Also, my mother-in-law had bilateral knee surgery at least 20 years ago with the older version that was supposed to last 15 years and hers are holding up fine. Mark’s are supposed to last 30 years, so hopefully it will all work out ok. I often think waiting for something like this is the worst part. Once you have the surgery, you will have things to do to aid your recovery, and you will see improvement day by day. Then, after you heal, you will have strong, useful knees without pain, and you will wonder why you ever doubted doing it. Best of wishes. Let us know how it goes. Hi christine…thank u so much..my Bilateral knee replacement wl b coming this 22nd june.2015. ..after the surgery 5 daya wl b in hoapital n 2 wk wl b at rehab…hope..wl be able to walk aw like a normal person..n back to my yoga..n joggibg track..n my age is 50.. I just read your comment to Christine. I am having my bilateral knee replacement on the very same day that you are, June 22. I’ll be interested to know how your experience is and will share mine, if you are interested. I wish you the best! Thanks for sharing your experience. I know sometimes the surgery does not go well, as in your case. I am so sorry for your struggles. Mark came close to needing a blood transfusion in the hospital as he was losing a lot of blood. They had him set up to “recycle” the blood he was losing for the first 24 hours, I think. It worked out okay, but I remember being worried at the time, and thinking I was in over my head. Mark did take prescription pain medicine for a while. It didn’t seem to have any lasting adverse effects on him, although I can understand your reluctance. Mark also experienced trouble sleeping at first and for a while because of discomfit in his legs, likely the nerve damage your are talking about. He got over it. Although I don’t recall Mark ever referring to his knees as “bricks,” he did say that they felt “clunky.” I don’t think he notices much of anything different anymore now that he is 3-1/2 years out. “I love my knees,” he says. Your experience does sound a little like a nightmare. You have my sympathy. As much as I suspect you don’t want to do it, I hope you are able to have another surgery to get things straightened out. Please keep us posted as to your recovery. Stay strong and hopeful. It would be helpful if we could identify the location (hospital, city) where we had or are planning to have the surgery. Also who was the doctor? Would you recommend her or him? I live on Maui, one of the smaller rural islands in Hawaii, which is wonderful as long as one doesn’t require specialty care. It’s been difficult to find docs who are skilled at simultaneous bilateral TKR. This blog allowed me to connect to several others one-on-one which has been really helpful. In mid-July (2015) I am planning to meet with Dr Kace Ezzet at Scripps in San Diego. I have to fly there once for a consult, and later for surgery, at my own expense, and I expect to return once or twice for check ups. Mark was quite a bit younger, at 55. I don’t really know what to think about your friend’s age. Have you read through the comments? Some people who’ve had the surgery were quite a bit older. I had bilateral knee replacement on January 8 this year. I turned 71 on Jan 25th. My overall health is very good. My new knees will be 6 months old tomorrow and all is going well. I am on the predicted recovery track. I am able to do most anything I want. I wake up full of energy and pain free; by 2 pm I usually reach for an aleve or a couple of tylenol if I’ve had a very active morning; by 7 pm my knees are saying “enough already.” I live in a house with 3 floors and have no trouble on the stairs, although carrying a full load of laundry is a bit taxing. I can get in and out of a kayak well enough and play golf (though not better than pre-surgery!) and garden. I would do the surgery again if the need arose. My surgeon prepared me well for the stages of recovery, the need to exercise, and not gain weight. I have to remind myself that it can take a year or more for full recovery. Good luck! Patricia Brady, where did you have surgery? Who is your surgeon? I’m going for consult next week with Kace Ezzet at Scripps La Jolla. I share this bc I think it’s difficult for patients to locate a great surgeon who is knowledgeable and experienced with bilateral TKR. Dartmouth Hitchcock Medical Center, Lebanon, NH. Dr. Karl Koenig. Thanks Patricia. I love your story! Hi Patricia, I live in Concord NH and both knees are bone on bone. The left one is more painful than the right; I feel that bilateral TKR surgery is the most sensible for me I too live in a house with three floors. What is concerning me is timing and location for the surgery. I notice that your surgery was done in the winter. I personally experience more pain in my knees in the winter here in NH. Did you have that problem before your surgery and were there any seasonal considerations in selecting your surgical date? I am also considering going out of the area for the surgery but would rather not if there are excellent surgeons, rehab, etc. available here. Thank you in advance for your response. I am 5 years post-bilateral surgery and still have issues when humidity is high — my knees become uncomfortable. I live in San Diego, CA, so humidity is not too much of an issue. Weather always played a part in my knee pain (prior to surgery) as it does with many who suffer from arthritis. Barometric pressure plays a very important part re: pain due to weather conditions. Look it up for full clarification. Good luck to you and bilateral is definitely the way to go — why do it twice. Thank you, Jacky, for your comments regarding weather-related discomfort. I will follow up for sure. Hi Jacky (and other knee patients). I’m scheduled for bilateral replacements with Kace Ezzet at Scripps Green Hospital on October 21, or maybe sooner if someone has to cancel. I’m now doing physical therapy twice a day for strength and flexibility. I recommend pre-op PT to everyone. I’m not able to do much, but I’m told even a little bit can make recovery easier. I think you are smart about the pre-op therapy. Keep it up. Good luck with your surgery. Let us know how it goes. Livit, I have marked my calendar and will definitely make an effort to visit you at Scripps. I did not do PT until after surgery and should have! You sounded so fit when I spoke to you that I wouldn’t think you would need it. Now, it seems to be recommended prior to surgery, which is a smart thing. I am already so out of date having had surgery five years ago. I am thrilled that you were able to schedule your surgery in San Diego with my surgeon. Bilateral rocks and is the only way to go! (Unless you doctor doesn’t recommend it.) I know you will be pleased, especially with all your travel involved. If I can be of assistance, give me a yell. I can’t wait to see you post your success story and rave about the positives of doing both knees at the same time. Scripps Greens has a mission statement that you will not have pain — and it was true for me. Thanks for supporting other readers. I just love how this page has turned into a little communication board. It’s been fun to watch. Jackie and all, I can’t tell you what an amazing impact your knowledge, experience and support mean to me, and all of us sharing this journey! I am still hearing horror stories from people who have never injured their knees, much less had surgery. Even my dear PT warned me last week that I should expect pain-a lot of pain. I told her I would take whatever medications will manage the pain enough to allow me to exercise. I simply smile and tell them I’m expecting twins on October 21, 2015! That certainly raises a few eyebrows, given my age 🙂 (63 yr old body, 17 yr old energy!) I look forward to meeting you Jackie, and any other readers in San Diego at that time. I’m counting on moving from the hospital to Scripps Acute Inpatient Rehab in Encinitas, and after release, to my dear but busy friend Kathleen’s house in University City for several more months of rehab. Very nice piece of information. Kudos to you! When I did a search on Google, I came across this post http://www.india4health.com/totalkneereplacement.html which says it takes only 3-6 months for the patient to recover. This is what made me feel good to go for Total Knee Replacement. Thanks for stopping by. I hope everything goes well for you and that you have a speedy recovery too. I am 57 years and had total replacement on both knees 7 months ago. All I can say is that it was the best thing I ever did! I walked in pain for 10 years…with trying many different techniques, shots, etc. , but the knees just couldn’t take it anymore and I was walking with a cane! The pain I had after surgery was just that…surgery pain and if you take your pain meds you will do fine! I went to rehab center for 3 weeks after staying in hospital for 4 days. I did my physical therapy as much as they would let me. I was bound and determined to recover as soon as possible. I still have stiffness in the knees, especially when I get up in the morning. I feel like a walking robot! Once I start walking a bit it goes back to normal! I still ride the stationary bike and use the leg machines at the rehab center every other day, just to keep me moving,. My rehab center lets you come as much as you want to workout for free! Life is so wonderful now! Thanks for sharing your story, Debbie. I think reading all these success stories helps to calm others’ fears. I’m happy for you. That is so encouraging, Debbie. Where did you have your surgery and who did it? I’m getting the sense that at Scripps in San Diego, where I’ll be rebuilt, I’ll be out of the hospital in 2-3 days, and in a rehab facility for 10 days to 2 weeks. Beginning to wonder if that will be enough. One thing I haven’t seen discussed (although I may have missed) is types of anesthesia. I asked my surgeon and he said he didn’t care, and generally the anesthesiologist decides. Well, I’m not one for passively allowing someone else to choose what’s best for me, nor waiting till the last minute to make such an important decision. So, I’m debating general vs regional + a mild sedative that zones me out and makes me forget anything I might have seen or heard that would be disturbing. I’ve read the pros and cons, but not as applied to the longer surgery time for bilateral knee replacement. I’m trying to reach an anesthesiolgist who works at Scripps to discuss ahead of time. Anesthesia Service Medical Group is a large agency and seems to be the only one affiliated with Scripps. I’m waiting for someone to get back to me. Any thoughts? Boy, it’s only about a month away — count down. Quit worrying about pain. Scripps has a mission statement that you will not feel pain. I had a general — I strongly believe in being totally knocked out. When I had foot surgery they just did a local and all of the sawing and noises really bothered me. Never want to go through that again. Of course, it’s a personal experience. I also think a general makes your surgeon more comfortable and relaxed. This seems to be an old post, but I haven’t seen it. So sorry if I am giving out-of-date advise. Thanks so much Jacky for your feedback and encouragement. I’m excited and nervous, and as prepared as one can be. I able to have a consult with a wonderful anesthesiologist who described all the options. I think I’m going with general. I am going in Friday for Bilateril Knee Replacement this Friday Sept. 25. looking through everything on the internet, this is the best information I have found. I had my hip replaced last year and was back to work in 4 weeks. i understand this will be a little more challenging. No Pain, No Gain. The pain I have now prevents me from doing most anything so i am sure the rehab will be exciting to know that I will finally be headed to healthier me and lifestyle free of continuous pain. Thanks for sharing your story. I can only hope I do as well. I think my wife is more worried than I because she has some of the same reservations as you. I’m glad you found this helpful. I hope it goes well for you too. Good luck on Friday. Best of luck Derek. You sound very prepared. I’m following right behind you, on Oct 21. Because of this blog and the people who participate in it, I have confidence in my decision to go forward with simultaneous bilateral. We’ll have to keep each other posted! Christine – I want to thank you from the bottom of my heart to allow this blog to continue. I am having bilateral TKR and I have found SO much useful information here and I have even changed surgeons (going to Dr. Ezzet at Scripps) with the recommendations that I’ve found on your blog. I am determined, but I have bouts of fear…particularly when the naysayers tell me that I’m crazy for doing both at the same time. Why do people (most whom I don’t even know!) feel the need to tell me horror stories??? I am doing pre-rehab 3 days a week and trying to lose another 30+ lbs before surgery. I am hoping to get scheduled for surgery in the beginning of December or the beginning of January. I hope I have the same recovery as I’ve read here, but I’m preparing for a couple weeks in an inpatient rehab, just in case. I’m sending a big virtual hug to Christine and to all of you who have shared your stories in the comments of this blog. Thank you all so much for helping to alleviate my fears. I’m glad you found the experiences shared here helpful and supportive. No one can predict how difficult or easy surgery will be for any given individual, but as you can see if you were able to read most of the comments, quite a few people do very well with this surgery. I think you have a good attitude to try to get in good shape before the surgery. I believe that will help you. You can do it. Let us know how it goes. Best of wishes. Thank you. 🙂 I know recovery times vary and I’m trying to do my best to be as prepared as possible. That’s really all you can do. On a side note, I went to visit my local orthopedic surgeon who I was “on the fence with” and he told me that I would be out of the hospital within 24 hours after the surgery. My jaw dropped. I just can’t imagine that being possible…a great hope…but really?? The question is — will you be out of the hospital and into a rehab hospital. I was only in the hospital three days and then transferred to a rehab hospital which was wonderful. Lying in a hospital doesn’t do you any good. It is the physical therapy that gets you up and recovering. Now, if he is sending you home on your own after 24 hours I would be seriously concerned. I came home pretty freaked out, but positive that I wasn’t going to put my knees in his hands. I had total double knee replacement in June 2015. I was driving and off all medications in 3 weeks… I had a great PT and we worked hard though I still do not have as much range of motion as I would like. As for your hospital stay I suggest staying as long as they let you. You will need help going to the bathroom. Things like just getting used to lack of motion, using a walker and really regaining your strength. Do you already have your home plan ready? Like a handle on your toilet, a chair in the shower, food in the freezer, a basket of water snacks and you pain med chart? I’m having bilateral surgery on February 3/16 (the wait list is longer in Canada) and, aside from general nervousness about the surgery, I’m most worried about infection. My brother-in-law, who is a physician, questioned my decision on having double surgery, reminding me that hospitals are the worst (best?) place to get the super bug-antibiotic-resistant infections (eg. Staphylococcus aureus); the downside of double surgery is that if one knee becomes infected, it will go into both. Although the chances are low of getting one, it’s one of the hardest post-op complications to deal with. I’m hoping to spend as little time as possible in the hospital. Did anyone have any experience with infection? Your wonderful blog about your husband’s surgery really helped turn the page for me. My surgery is still 5 months down the road (my surgeon is a VERY popular OS), but I wanted to touch base and say “thank you” now! Your blog has positively touched a LOT of lives, and CONTINUES to touch many people!! Bilateral Knee Replacement 1/13/16. Five days in hospital then home with husbands care. Home PT for 10 days then outpatient. If I had it to do over I might have gone to a rehab for 2 weeks as it was a lot for my husband. Nights are most difficult to get comfortable.I am week 3 and it is terribly boring. Everyday is better though. Thanks for sharing your experience with everyone. Hopefully the worst is behind you, and you’ll be happy with your new knees come spring. Thank you so much for sharing mark’s experience with having bi lateral knee replacement. I am scheduled to have the same operation done on 4/12/2106 and I’m a bit anxious. After reading blog after blog about one common event everyone had experienced after surgery. PAIN! It may make someone second guess the decision to actually go through with the operation. I have had pain in my knees for many years now. 35 years of competitive basketball will do that but after all it was self induced 🙂 So I have only myself to blame. Mark’s bullheaded approach to working hard and over doing it is exactly the approach I will take. I too have worked my legs hard over the last few months to prepare. I’m hoping this prep work will translate into less pain and a quicker recovery. Thank you again. I will send a follow up blog after I have my surgery. Good luck on your upcoming surgery. I hope it all goes well for you. I look forward to hearing from you afterwards. Best of wishes. I thought I would write something about pain. I had a bilateral knee replacement on 1 Feb 2016. I prepared with 7 weeks of physio exercises before going in, but am obese (BMI 42) so knew this would be a hard slog. I am 55. I am in Australia and had an outstanding surgeon. The surgery went really well and I had little swelling or bruising afterwards. All the nurses commented on what a great job he had done, and he did do an outstanding job. This blog has the best information I’ve found online and it prepared me well, but the first week was still a shock. By day 4 I was in the rehab ward and I had 2 weeks in the rehab ward which was also first class. I did 1.5 hours of physio exercises in the morning and the same in the afternoon. I did it religiously and still do – although now I’m doing 1 hour am and pm. My mobility progressed well and my flexion is on track. My scars are healing as expected. In a nutshell everything went as expected – except the pain! I want to write this cos there will be a small number of people in my boat. Most people are off the hard stuff (painkillers) by 6 weeks – or so I’d read and been told – so I was quite distraught when at 6 weeks I was still on the same level of painkillers as when I left the hospital. The surgeon was very supportive and said it’s different for every person, and he reminded me I’d had 2 knees done, not one. I want those whose pain abates more slowly to know they are not alone. I am now almost 10 weeks out and the pain is much much better. I am still on pain patches, but hoping to reduce (not eliminate) those this week. I am still on lyrica as well. I am now managing with only 1/2 an endone (oxycodone) a day (in addition to pain patches and lyrica), but I consider this a major achievement. There was a time at 6 weeks, 7 weeks, 8 weeks and close to 9 weeks when I despaired of the pain ever going away. But, it is. It is starting to ease up. I have reconciled with myself that I will need to take pain medication longer than most people, and I tell myself that I’m just not like most people in this particular recovery. I am hoping that things will start to improve quite rapidly in the pain department from here, but am realistic enough to know that they may not happen. And, if it doesnt, I’m just going to keep going with the pain medication until it does. So my message is, some people just have slower recoveries when it comes to pain and there isnt anything you can do about it except be patient – as infuriatingly frustrating as that is. All the best to all of you going through this. It’s a tough journey, but the other side looks brighter. It sounds like you are doing well, although I am sorry you are still having significant pain. Thanks for posting your experience. I am sure you are not the only one. Best of wishes. I hope you are able to fully enjoy your new knees soon. My surgery went well on 4/16/2016. Took less than 3 hours. Everything as well as could be expected with no complications according to the Dr.They had me up and walking around that same day. 1 thing I’d like to mention which the Dr nor the Anesthesiologist mentioned was that if you have nerve blocks but in for both knees (which I did) they will wear off very quickly and without warning so the knee pain will hit hard. It hit me that first night and I couldn’t sleep. I stayed in the hospital for 2 1/2 days (they said I can leave 1 day early) and then right to an acute rehab center for 6 days. There I had PT and OT for 3 hours a day. I came home on wed 8 days after my surgery. My wife has been my rock and has supporting me with all my needs better than any person could have. I want to thank her for being there for me. I received a sheet with a bunch of exercises to do at home and have been doing them very aggressively. I also prepared before the surgery by exercising and getting all my lower body ready for what was to happen. The other thing I did before my surgery was to build my upper body as well. This helped when it came time to support myself on the walker and getting in the car. Very important detail that people should explore before surgery. I am 10 days post op and going to out patient PT 3 times a week. Everything seems to be going well except I do not have the range of motion I would like to at this point. They say the Dr likes to have his patients at 90 degrees at the 2 week checkup when I get my staples out. My left knee did get to 90 once but that was after the PT cranked on it for a while. The right one is close to 80 but is way behind the right one. The Dr does not use a CRM machine so it’s alldone with PT. It’s a little discouraging with the range of range motion but other than that thing seem to be progressing nicely. Actually the operation was on 4/12/2016. Typo. Thanks for letting us know how it went and for the tips. Good luck with the rest of your recovery. Thanks for this very helpful blog! How old was Mark at the time of his surgery? I’m 63 1/2 and looking at this surgery in a year or so. Sorry if his age is already mentioned somewhere in the blog that I missed. Age seems to me to be an important factor in this surgery and recovery from it. Reading through all the comments here is so valuable for anyone considering a knee replacement. Thanks for keeping this alive for well over four years now. I would like to share my experience with you..
My mom was suffering from knee pain from last couple months. I consulted with 2-3 orthopedic doctors in Pune, but was not satisfied. After done replacement by Dr Anshu sachdev,finally my mom is free from knee pain and that significantly changed her day to day life. Helpful Links, we can understand better through your links. Please ignore my question a couple days ago about Mark’s age at surgery. I see that it was 55. No problem. Good luck with your surgery. Mark’s life has really changed for the better since he’s had his. Hubby anticipating bilateral knee replacement, wondering if they have to catheterize male patients for this. I thought he was, but he has no memory of it. Probably should ask your doctor if it is a big concern for you and/or him. My husband, who is 65 years old and stands at 6 foot 2 inches, had a bilateral knee replacement 1 week ago yesterday (April 4 surgery) and he’s doing pretty awesome. He was in the hospital for 2 and 1/2 days and he also had a blood count issue, which seemed to clear up overnight. He had to be catheterized too. He is already at 90 degrees, which his doctor told him he would be at for his post-op appointment, and his post-op is not until April 11. We, together, are pretty persistent using the CRM machine for his ROM, and also in his exercises to strengthen the different muscles in his legs. The exercises are an extremely important part of recovery to get those knees working again. I couldn’t be more proud to see him push himself, but not too far as to hurt himself. For those of you waiting to do a bilateral knee surgery, I urge you not to wait too long. If you are in your 80’s and not in good health, you are not a good candidate, because you’ll be going through quite a bit during surgery and recovery. Also, if you don’t have anybody to help you get through recovery, it’ll probably be a much longer recovery period. We are both lucky that we work from home and are both in pretty good health. We decided on my husband’s bilateral knee replacement together, because not only did he need the right mindset, but I too needed to be in the right mindset being his 24/7 caregiver. We are avid golfers and excited for a summer, without my husband’s painful knees. My husband will have two great working knees for the summer and for years to come, and he also quit smoking 5 weeks before his surgery to help with the healing, he smoked for 50 years! That was an extra plus for us! Good luck to all those considering bilateral knee surgery and be positive! Thanks for commenting. Sounds like you’re on the right path. He’ll love his new knees.